One of the most prolific and influential French geographers and cartographers of the late 17th and early 18th Century. Nicolas was the youngest son of Parisian print and mapseller, Antoine de Fer [d.1673], a close associate of Nicolas Berey, Melchior Tavernier and Jacques Lagnet during the middle years of the Century. Antoine married Geneviève Hourlier in 1633 but his business never achieved first rank status, his main speciality being the republication of plates that he purchased from other Parisian mapsellers and editors. At the age of 12 Nicolas was apprenticed to fellow Parisian engraver, Louis Spirinx, but it was not until 1669, at the age of 23, that he achieved authorship of his first known map, a curious phonetically titled map of the Canal du Midi. On the death of his father in June 1673, the latter's estate was settled on his widow and three sons, though it took a further two years to resolve the legalities, which retained the widow de Fer's involvement in the mapselling business, and in fact it was not until 1687, that the widow de Fer retired from business through infirmity and old age and passed on the somewhat declining mapselling business and all its assets together with the rental of a shop and atelier in the Quai de L'Horloge to Nicolas. In 1690 de Fer's fortunes changed, as he became official geographer to the French Dauphin and published his first Atlas of the Coasts of France. 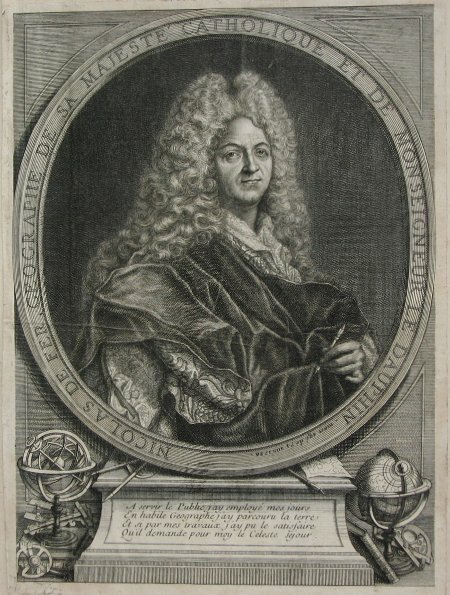 Within the next 30 years he acquired additional royal support, becoming official geographer to the Spanish King (formerly the French Duke of Anjou) in 1702, and after the death of the Dauphin in 1711, official geographer to both Spanish and French kings, and in the final year of his life, Géographe ordinaire de sa Majesté Catholique. With such important royal support, his maps became mouthpieces of royal Bourbon propaganda, emphasizing the power and benefits of Bourbon rule and endorsing the political and territorial expansionism of the Sun King. The final 30 years of his life also saw a prolific output of Atlases which included : Atlas Curieux [1700-5] and its subsequent suites; Atlas ou Receuil des Cartes ; Atlas Royale ; Les Beautés de la France ; Atlases detailing wars and countries relating to the Spanish succession ; Italy  & Germany  and Franco-Belgian frontiers [1708-10]; Les Forces de L'Europe [1690-95]; Introduction à la Géographie ; the Petit Nouveau Atlas  and four Atlases, comprised of maps from previous works, detailing the theatre of the wars in the Low Countries, on the Rhine, in Germany and in Catholic Flanders [1696-1702]. Aswell as his Atlas output de Fer is also well known for his large Wall maps, some 26 in total, aswell as large-scale town plans of European cities, and a signifcant output of thematic printed card games. His sign and emblem was the Sphère Royale, originally that of Melchior Tavernier, to which he was greatly attached and which appears on a large number of his works. He died on 25th October 1720 and his estate was divided between his three daughters, all three of whose husbands were closely involved in the Parisian engraving and publishing business : Guillaume Danet, bookseller on the Pont Notre Dame; Remi Richer, engraver of geographical works on the Quai de L'Horloge and Jaques-Francois Besnard or Bénard, engraver to the King of Spain in the rue de Callande. Richer sold his share in the estate to his two brothers-in-law in 1721 and a number of de Fer's maps and atlases continued to be published by his heirs for another twenty or thirty years.